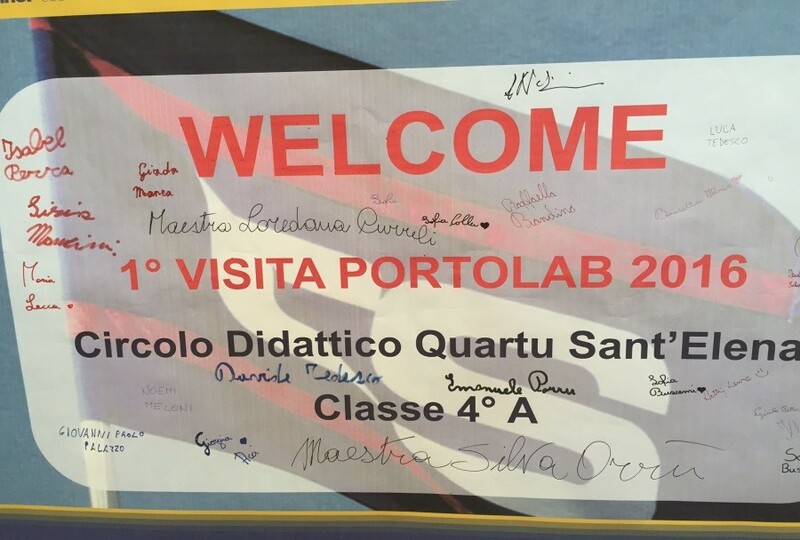 Season premiere for 2016 Porto Lab visits: we started with Cagliari, which hosted on January 19th the kids of the primary school of Quartu Sant’Elena. 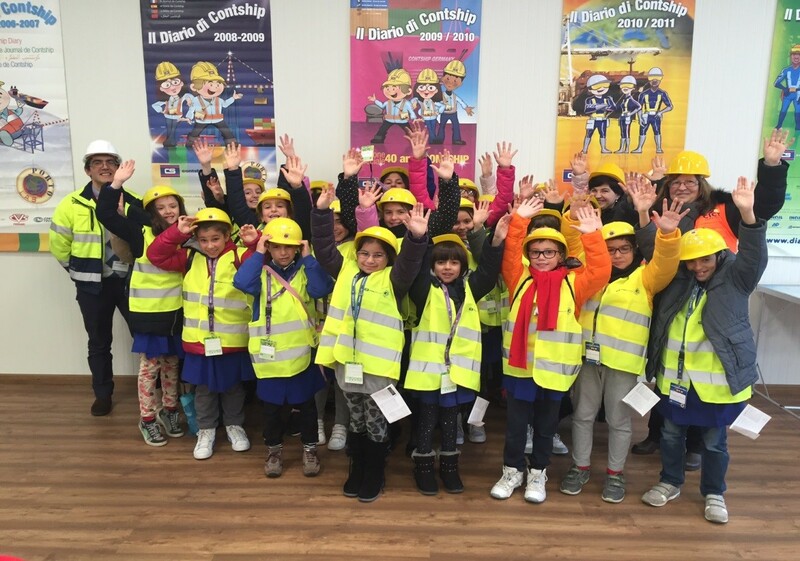 Twenty-three young boys and girls, excited to start the New Year with a visit to Cagliari International Container Terminal, have been welcomed by Porto Lab tutors Hetty, Andrea and Eliseo, who showed them the new Porto Lab website (www.portolab.it) and some short videos about CICT. After a short introduction regarding the “unusual” setting, the Tutors handed out helmets and high visibility jackets (for safety), lanyard and ID badge (for security) and … stickers (for….FUN!). Now ready to access the terminal area, the young guests followed Andrea, who introduced them to the obscure world of symbols and numbers painted on every container shell: everyone can see them, but very few people can understand their meaning! From the boxes to the huge machines used to move them: time to learn more about the yard equipment: Quay Cranes, RTGs, Trucks & Multitrailers … there’s certainly no shortage of heavy machinery at CICT, especially on a busy day like this: students have been lucky to find four vessels contemporarily berthed along the quay, with live loading and unloading operations taking place between feeder and mother vessels. 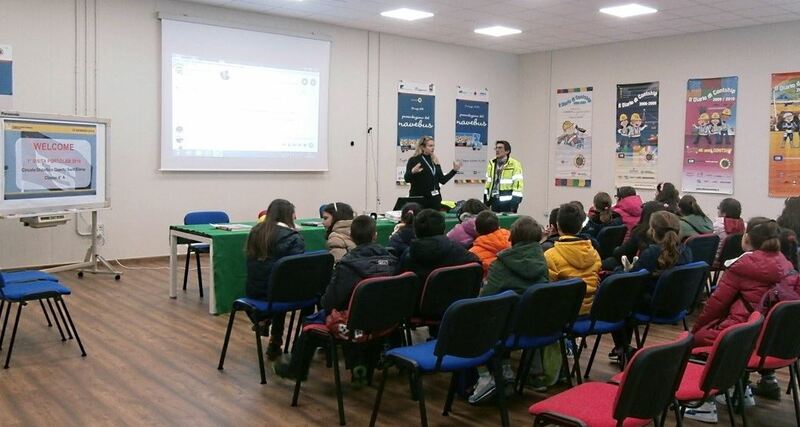 Busy days for LSCT, too: on Tuesday, January 28th the ligurian gateway opened its gates to 36 students from the elementary school “Paradiso” (Marina di Carrara), inaugurating Porto Lab 2016 with the participation of representatives from the Custom Agency, Guardia di Finanza (Financial guard) and the veterinarians of the port of La Spezia. During 2016, LSCT expects to host more than 850 students and 37 different classes. 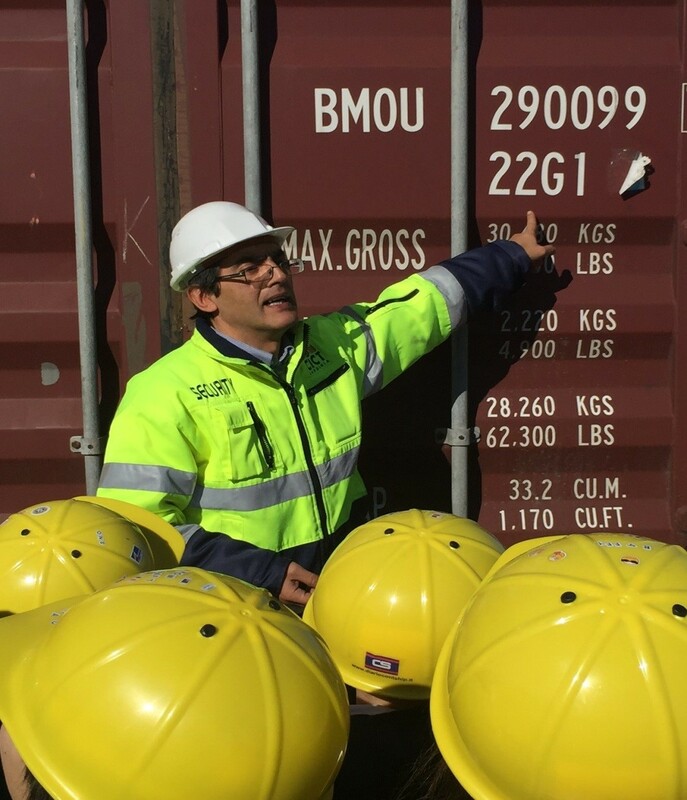 MCT – Medcenter Container Terminal welcomed kids from Palmi on Tuesday February 2nd, and will soon continue with more classes both from Palmi and Gioia Tauro. Everything ready at TCR – Terminal Container Ravenna, too: after the first visit on February 4th continuing on the 11th, 18th and 25th. Melzo followed with the first visit on February 9th, and then will replicate on the 16th, and 23rd with visiting students from Inzago and Rho (April 19th). Contship team is enthusiastic about continuing and further devoloping this incredible project, which has reached its 10th year in 2016. The Group wishes to thank all the children, teachers and tutors involved.